3/9/2017Share this story on Facebook! Business Professions Week provides Ithaca College students with the opportunity to network with professionals outside of their area of study, providing them with a plethora of career options to pursue after graduation. For business students, the week offers opportunities and events to explore professional options that extend beyond the corporate world. 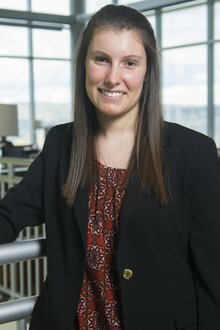 Lisa Famularo ’16 developed the idea during her junior year as a class project for her course, “Leadership and Collaboration.” Her concept addressed the needs of the School of Business community, which lacked resources for business students to explore their major in-depth. With her group, Famularo worked to develop her concept for the campus community through a series of events and panels to highlight professional and career options for students. She said past events have included inviting back alumni to speak about their professional experiences, hosting a trivia game in which students could learn about different industries within the business field, and playing a game to teach students how to tie a necktie for the sake of discussing professional dress. Famularo developed the idea of Business Professions Week because she wanted to create a program to help students navigate their college experiences and future career paths. She said through her involvements at IC, she realized she was having an impact on students struggling through college. As a three-year Peer Career Advisor in the Office of Career Services, she mentored students in career development by helping them write resumes and cover letters, network and search for jobs and internships. During her two years as a Student Leadership Consultant in the Office of Student Engagement and Multicultural Affairs, Famularo’s work mostly focused on implementing programs and services that will guide students toward a successful college experience. Her projects consisted of building and improving programs for various departments, including student organizations, student leadership, community service and the first-year experience. Her favorite moment on the job took place during Leadership Weekend, a leadership retreat for first-year students. At the retreat, Famularo facilitated a workshop on how to write a personal mission statement for 10 to 20 students, who were all thrilled to grow as campus leaders. “We ended up having a really good conversation about how they could be leaders on campus as first-year students, which is sometimes seen as a very difficult task,” she said. For Famularo, the next move was her decision to attend graduate school at the University of Connecticut, where she is working on her master’s degree in higher education and student affairs. Through her masters, she hopes to learn about the theory behind college student development and the phases that students go through throughout college. Her studies at UCONN align with her status as a leader at IC. In the future, she said she hopes to create programs and meet one-on-one with students to bring them to their full potential in accomplishing as much as they can during their college years. Famularo plans to return to IC on Oct. 28 during the 2016 Business Professions Week to host a session on post-college transition and her work at UCONN. “In the end, I really hope that students walk away having a better understanding of options and feel more comfortable making the next decision in their professional journey,” she said.